I have reviewed all minutes of the MSD Decatur Township School Board that are posted on the District website. These include all of the minutes from regularly scheduled Board meetings for the years 2006, 2007, 2008, and 2009. No minutes for special sessions or work sessions are posted, although they are shown approved in the minutes of the regular meetings. It is very disturbing that at no time from January, 2006, through December, 2009, is there any mention of any contract nor is there any record of any contract being submitted to the Board for a vote. Approval of contracts Sec. 8. Notwithstanding any other law, the president and secretary of the governing body of a school corporation are entitled, on behalf of the school corporation, to sign any contract, including employment contracts and contracts for goods and services. However, each contract must be approved by a majority of all members of the governing body. In the absence of either the president or secretary of the governing body, the vice president is entitled to sign the contracts with the officer who is present. Indeed, at no point in these years of minutes, was there either mention of the public opening of competitive bids by the Board, or a designation of a committee to take on that responsibility on behalf of the Board. IC 20-26-4-6Bids for purchase of supplies or equipment Sec. 6. (3) for any similar purpose. (3) must be available for inspection. (c) The bids described in subsection (a) must be reported to and the tabulation entered upon the records of the governing body at the governing body's next meeting following the bid opening. (d) A bid described in subsection (a) may not be accepted or rejected by the committee, but the bid must be accepted or rejected solely by the governing body in a board meeting open to the public as provided in section 3 of this chapter. The Board is either being deliberately kept in the dark by its Administration or it is willfully avoiding disclosure of fiscal matters to the public in its meetings. Either way, these violations of State law should cease at once so that the public can have the access to this information - a protection created by the laws. An additional State law was violated just last Thursday evening. On January 28, 2010, the MSD Decatur Township School Board held an executive session followed by a special meeting which was followed by a work session. I am still looking into how legally adequate the notice of these three meetings was. But, one thing is clear - the location of these meetings in the Southwest Pavilion Office Building instead of the School Board room is a violation of State law. (c) Special meetings of a governing body must be held on call by the governing body's president or by the superintendent of the school corporation. The call must be evidenced by a written notice specifying the date, time, and place of the meeting, delivered to each member personally or sent by mail or telegram so that each member has at least seventy-two (72) hours notice of the special meeting. Special meetings must be held at the regular meeting place of the board. The regular meeting place is the Board Room in the Central Office. That meeting was held in violation of at least this State law. The attitude of this School Board and this School District Administration is to do whatever they please. Regardless even of State laws that are easily located. The next School Board to be seated in MSD Decatur Township should immediately establish a policy that bans nepotism. Hiring relatives gives the appearance of favoritism, cronyism, and outright payback, to the community and to the employees of the school district. Banning nepotism is a small price to pay for a demonstration to the overall community that all employment decisions in the district will be above reproach - only the best qualified will be hired. We all know about the current state of affairs in the Decatur School District. Lets start with the School Board. Dale Henson, to my knowledge, has never had a relative who was hired while Henson has been on the Board. That is good. Doug Greenwald, to my knowledge, has never had a relative who was hired while he has been a Member of the Board. That also is good. Cathy Wiseman has had at least one son on the payroll since being elected. Judy Collins has a daughter on the payroll. And, most famous of all, Don Huffman has a grandson on the payroll - which actually necessitated the ouster of an employee from his position to accomplish. Hiring relatives gives the appearance of favoritism, cronyism, and outright payback. Now lets turn our attention to the Administration. Candice Baer was hired into a position created just after she lost her job as Superintendent of Center Grove Schools. Candice is married to Assistant Superintendent for Business, Jeff Baer. Hiring relatives gives the appearance of favoritism, cronyism, and outright payback. Now, I will presume that all of these folks are highly qualified individuals who could have gotten a job in any School District in the land. Well, then let them. Employing relatives of highly placed individuals brings baggage with it. Unnecessary baggage. Nepotism is banned by law in other units of Government and should be banned in School Districts as well. Until State law bans nepotism in School Districts, the School Board should create a policy banning it in our District. Here is what I would propose for a policy. Any individual may run for and be seated on the School Board if their relative was already an employee of the District at the time of that person filing to be on the ballot. After filing to be on the ballot or after being seated on the Board, no relative of a School Board member may be hired by the District until one year after that Member leaves the Board. No relative of any Administrator (central office or building level) may be hired by the District while that Administrator is employed by the District and for one year after that Administrator leaves the employ of the District. No relative of the leadership of the Teachers Union may be hired by the District while they are in positions of leadership and for one year after they leave those positions. Nobody in a leadership position of the Teachers Union may be hired into an Administrator position within the District for two years after they leave that leadership position. No relative of a head of Security, Transportation, or any other department headed by a non-administrator, may be hired by the District while that department head is employed by the District and for one year after they leave that position. Qualified people can find a job in a nearby District. Public trust in the system is eroded when nepotism is allowed to flourish as it has in the Decatur School District. A 'no nepotism' policy created by the new School Board would improve this District and its reputation. A message has been sent out from Gary Pellico on behalf of the MSD Decatur Township School District. It seems the School Board actually voted on some budget restructuring items at last night's work session. The MSD Decatur Township School Board began the process of fiscal restructuring at a special session last night approving a plan for the administrative cuts. Although the Superintendent had recommended a 20% reduction in his salary to lead the way, the board amended the recommendation to a 15% reduction. They then proceeded to accept the 5% reduction in administrative staff salary and capping insurance benefits. The board also voted to reduce five administrative positions effective for the 2010-2011 school year. These positions included 4 building level administrators and one central office administrator which results in two central office positions including the retirement of Dr. Jeff Baer. In other action, the board voted to continue conversation about ways to make the Pavilion profitable and remain open to the public. They will look at plans and ideas presented during the community input session earlier in the week. The board also listened to an update on plans to have a district-wide celebration of unity and support in the spring. This event is being planned by the parent organizations and student council groups from schools throughout the district. The board will meet in Executive Session on Thursday, February 4 to consider additional steps necessary for fiscal restructuring. This meeting will be held in the board room of the administrative offices at 6:00 p.m. Executive sessions are not open to the public. The next regular school board meeting will be held on Thursday, February 11 at 7:00 p.m.
My first reactions: Stinson supposedly wanted a 20% cut, but the Board said "NO - 15% is enough"???? What is wrong with that picture - let me count the ways. Exactly how does cutting Jeff Baer's position while simultaneously replacing Jeff Baer result in a loss of an Administration position??? Candice Baer already was leaving the district, so losing that position, created specifically for her to begin with, is no hard hit on the Administration. Yup, taking care of the Administrators first. These reductions are minor. Getting your name on the ballot to run for School Board seems like a daunting task at first. But, if you go step by step, you will find it is rather easy. In short -- you download the form, fill out your part of it, collect at least 10 signatures of support, get the form notarized and file it with the Election Board before the filing deadline - which in Marion County is noon, Friday, February 19, 2010. In Marion County, the election for School Board will be held May 4, 2010. Each School District has is own School Board districts. Click here to view a map of all School Board districts in the County. I have posted a cut-out of the MSD Decatur Township School Board districts below. Which District has open seats? Decatur Township has three School Board districts; simply called district 1, district 2, district 3. Candidates can only run for an open Board seat in the district in which they live. And, they must have lived in the district for at least one year before Election Day. There can be no more than two Board members from any one district serving at the same time. Currently 3 seats are up for election on May 4; Cathy Wiseman's seat in district 1, Dale Henson's seat in district 3, and Judy Collins' seat in district 3. There are NO seats open in district 2 at this time. At the May 4th election, Decatur can vote for two candidates from district 1 and one from district two - or visa versa. District 1 is the smaller area district in the northeast corner of the Township. District 2 is the one that runs south of I-456 and along the White River. 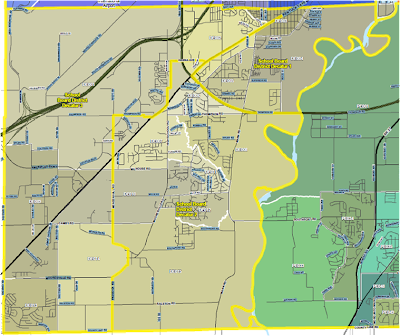 District 3 is the one that takes in Troy Avenue to the north and the Hendricks County line to the west. Who is qualified to run for School Board? The following information is taken from the Candidates Guide posted on the Secretary of State's website. Go to page 73 for information on School Board races. You must be 21 years of age or older. You must reside in the School Board district in which you are running and must have lived there since at least May 4, 2009. You must be a registered voter in the district you wish to represent by noon, February 19, 2010; that means there is still time to register to vote so you can run for School Board. You must not have been previously convicted of a felony. You CANNOT run for a seat on the same School Board that governs the School District for which you work (you can be a teacher or custodian in Perry Township Schools and run for the Decatur Board, for example; but you cannot work for the Metropolitan School District of Decatur Township and run for the Decatur School Board). Basically, you fill out your name and address type of information and you get the signatures of ten people who live in the same School Board district as you AND who are registered to vote in that district. So, someone who just moved into the district, but who has not yet switched their voter registration to their new address, would not be qualified to sign your petition. You can collect more than ten signatures (use two copies of page 1 of the form and staple those to one copy of page 2) just to be sure you get the required number of qualified signatures. Each signer must provide their name, address, and date of birth so that the Election Board can verify that they meet the requirements to sign for your candidacy. The form must be notarized after you have all of your signatures. The completed forms must be turned in to the Election Board no later than noon, Friday, February 19, 2010. The office is located in the City-County Building on the first floor. If you come in the Market street entrance, walk down the hallway on your right after going through security. The Clerk's Office will be on your right about half way down the hall. The Election Board office is in the far right hand corner of the Clerk's Office. Remember to leave time to get through security - noon is the absolute deadline and NO candidate can file after that time. If you do NOT receive more than $500 in campaign contributions OR do NOT spent more than $500 for your campaign, then you do NOT have to file a Campaign Finance Report. So, keep track of all contributions and all spending so that you know if and when you cross over that $500 limit. If you do cross over the limit, you can obtain the required forms and deadlines on the Election Board web pages - click here. It is rare that a School Board candidate hits that $500 limit. So that's it. We have three open seats up for election. The filing deadline is noon, February 19, 2010. Think about running. Today I obtained a public record from the Indiana State Board of Accounts that lists the name and salary of every employee of the Metropolitan School District of Decatur Township. I asked for the latest record and received one filed on January 15, 2009. Every year, every governmental unit in Indiana must report the amount of salary payable to each employee for the month of January. Below I have the name of every administrator and the amount of salary reported for the month of January, 2009. I also calculated the yearly salary from that. Since the School District pays twice a month, it was a simple matter of multiplying the month's wages by 12. Also included is the same information for Directors or Supervisors as well as other top earners in the District. In the table below I sorted these employees by building. Those of you who attended one of the MSD Decatur Township School Board public hearings -- staff or community -- what was your take on what happened? Did you testify? If so, what points did you try to make? What points did other speakers make that resonated with you? What do you wish you, or somebody else, had said? How did the School Board and Adminstration react to the comments? Before Columbine, school security was entirely different. Threats of this source and magnitude weren't really imaginable. And the standard operating procedure for how security forces responded was entirely different. Not only did Columbine shatter our image of what threats are possible, it changed entirely, the recommended methods of response. Let me cut to the chase of this blog entry. Summing it all up, the Metropolitan School District of Decatur Township has not implemented recommended key facets of the Department of Homeland Security (DHS) first responder standards, have laid off trained MSD Security Officers, and propose cutting the MSD Security Department down to one, maybe none. This irresponsible attitude toward the safety of Decatur's children while they are in school MUST be reversed. In the High School, Superintendent Don Stinson has contracted with a private guard company whose personnel act as glorified hall monitors. They carry no weapons and they receive no DHS first responder training. Decatur Central High School is now the only High School in Marion County that does not have an armed and sworn Officer on premises for the protection of the students. I have mentioned much of this before in Decatur Central High School - Budget Cuts Target School Safety. In his "Fiscal Restructuring Plan", Stinson proposes cutting the MSD Security budget by another $54,000 and possibly winnowing it down to one, or even zero, Officers. This is an outrage. The School District must protect the children from harm while they are in school. And they must be prepared to protect them from the worst scenarios. I doubt that the entire MSD Security budget, even before the cuts began last year, amounts to half of what Stinson pulls down every year. That entire amount needs to be restored so that we have trained professionals on our school campuses. Let me give you a glimpse of how badly prepared our School District is to respond to a Columbine-like incident. The response to the takeover of Columbine High School was the standard operating procedure at the time. Isolate. Contain. Negotiate. Analysis of the entire incident and an evaluation of the effectiveness of the response led to a complete nationwide overhaul of the recommended methods employed by first responders. After Columbine the recommendations for first responders became to react immediately. Get into the building as soon as possible once you are aware that there is an serious incident of violence playing out. Turn the attention of the 'active shooter' away from innocent lives and toward the armed responders. Incidents that followed Columbine - in Pearl, MS, and Jonesboro, AK - show that the sooner armed first responders can gain entry to the building, the sooner the attack on innocent lives stops. So, training in first responder methods and standards recommended by the DHS is a MUST for our Security Officers in Decatur Schools. The contracted services of unarmed, untrained, glorified hall monitors does not meet that requirement. How should the trained security officers respond? Well, simply put, the first thing is AS FAST AS POSSIBLE. To do that we need to have the full contingent of officers on the School District payroll and on campus. While IMPD will always be called and will always come running - being on the spot as soon as possible and being on the spot with folks who know the campus and are familiar with the buildings as soon as possible - is a MUST. Laying off our School Security Officers and reducing the department to only one person would be laughable, if this weren't such serious business. Once on site, DHS recommends gaining entry from three different doors, simultaneously. That means you MUST have at least 3 first responders. At this point we have only two. If Stinson has his way, we will have only one. He calls it the 'Wayne Township model' - one full time officer and the remainder of the staff made up of moonlighting, off duty, IMPD officers. Only, that's not what the Wayne Township School District is doing. They have 4 full time Security Officers. We simply MUST return the Decatur Security Department to full staffing. That might cost another $50,000 - 75,000 a year. But, the priority MUST be on the safety of the students. PERIOD. To gain entry from three different doors, simultaneously, you need at least 3 trained Security Officers with 3 master keys. Susan Adams, the highly paid Administrator whose role is to be the head custodian, has refused to provide the Security Department with a sufficient number of master keys to facilitate immediate entry as recommended by the DHS model. She refuses to provide all District Security Officers with keys in direct contradiction of DHS first responder methods. We MUST provide all of our Security Officers with master keys. Come on. It's NOT THAT HARD ! What is supposed to happen once the first contingent of IMPD Officers arrive on the scene? They, too, are trained in DHS first responder methods and standards -- but, they are not familiar with the layout of our schools. DHS recommends that all School Security Officers carry a 'SWAT box' in their police vehicles at all times. In this SWAT box are to be the floor plans for each and every school in the district. They can share these floor plans with the IMPD Officers. It is not difficult to see how very important this recommendation is. Also in the SWAT box are to be the master keys needed to gain entry to every school in the district. Not only does Susan Adams refuse to provide the master keys, she even refuses to provide the required floor plans. Oh, for the love of Pete ! What on earth is going on in this School District ? What part of "Department of Homeland Security first responder standards" is so hard to understand as important ? Why is Stinson allowing Susan Adams to refuse to hand over keys and floor plans to our first responders? Why is Stinson hell bent on gutting our District Security Department? This petty, short sighted, crazy attitude toward the safety of Decatur's children MUST STOP. The cuts already implemented MUST be rolled back and no further cuts made. Keys MUST be provided to the District Security Officers. Floor plans MUST be provided to the District Security Officers. Stinson and his highly paid cronies like to say that the children are the priority. But, you sure cannot tell that by their actions. The Indianapolis Public School Board on Tuesday unanimously approved what amounts to a roughly 3 percent raise for Superintendent Eugene White. Are you kidding me? Have they not heard about the recession? Or the 3.5% budget cutbacks for all K-12 education? If we truly want to improve education in this state, we MUST look at the outrageous salaries of Administrators, class size, and rubber stamping school boards. One long term bright spot for the Decatur community has been the Armstrong Pavilion. It was built expressly for the community under the former MSD Decatur Township Superintendent Montgomery. The Pavilion is a metal building construction that houses a running track, some ball courts and a room with fitness equipment. Decatur residents can become members of the Pavilion for a token $5 per month, with a discount beyond that for our senior citizens. Schools also use the Pavilion, but the community is the primary user of the facility. As you all know, the School Board is now left to deal with the financial mess created by current Superintendent Don Stinson and Assistant Superintendent for Business, Jeff Baer. Under the proposed list of cuts offered by Stinson in his "Fiscal Restructuring Plan", he suggests that closing the Armstrong Pavilion to community members will save the district $170,000 a year. First of all, I can't see how you can save money if you still have the building open for school uses, but are losing the revenue from selling memberships, no matter how modest the dues are. Ignoring that, though, one does have to question Stinson's priorities. Why take away from the community what was built expressly for them? Why close the Pavilion to the community when Stinson still fully intends on moving the Central Office Administrators and staff over to the plush digs of the Southwest Pavilion Office Building (former Concentra Building)? Why try to save $170,000, even if its possible, when Stinson and Baer refuse to look at selling off their considerable real estate portfolio first? That portfolio is worth about $6 million and would go a long way to covering the $9.8 million shortfall, which is almost all due to Stinson and Baer's profligate spending. If they sold off just a small lot, they could keep the Armstrong Pavilion open to the Community. January 27 -- 4:00 to 6:00 pm -- the School Board will hold a public meeting intended for staff comments about Superintendent Don Stinson's 'Fiscal Restructuring Plan' -- Community Room of the Decatur Intermediate Learning Center on Mann Road. later that night -- 7:00 pm -- the School Board will hold a public meeting intended for public comments about the Plan -- Decatur Central High School cafeteria. January 28 -- 6:00 pm -- the School Board will hold a work session on the Plan -- no location mentioned, so it might be the Board room in the Central Office. February 11 -- 7:00 pm -- the School Board will hold its regularly scheduled monthly meeting -- again presumably in the Board room in the Central Office. What's Behind Closing Lynwood Elementary ? As regular readers of this blog know full well, the MSD Decatur Township Superintendent Don Stinson and his trusty Assistant Superintendent Jeff Baer, abetted by a rubber stamping School Board (notably Dale Henson, Don Huffman, Cathy Wiseman, Judy Collins and former member Larry Taylor), dug the District into a hug financial hole. Stinson and Baer broke state laws in purchasing property, clearly overpaying in at least one instance. They broke state laws in spending millions more from District funds than appropriated by the Board. They played fast and loose with credit card receipts. And, they broke even more laws in signing a long term lease for the Mitchell Building PLUS they pay out $810,000 a year for three educational enterprises that should be self-sufficient. Stinson has proposed a 'Fiscal Restructuring Plan' that is poorly written, inconsistent, and contains suggestions that are clearly unvetted for either possible implementation or fiscal impact. One suggestion was to pull all of the students from Lynwood Elementary and assign them to other schools in the district AND make the Intermediate School a grade 1-6 building along with the three remaining elementary schools AND move the Early Childhood Center (ECC) out of its building and into the vacated Lynwood building. Not to be lost in the recap -- Stinson's Plan does NOT suggest the District sell off its unneeded properties, including the Southwest Pavilion Office Building (former Concentra Building). Stinson fully expects to move the Central Office crew, who will suffer very minor cuts in big paycheck Administrators under his Plan, over to the cushy confines of the Southwest Pavilion as soon as possible. The background in all of the proposals swirling around Lynwood and the ECC are these. Lynwood has failed the provisions of No Child Left Behind for three years and Stinson fully expects a repeat this year. One of the penalties for failing NCLB for 4 years is that all of the students must be allowed to attend any other elementary school in the District. Stephen Decatur Elementary can still accept students. Valley Mills and West Newton Elementary Schools filled up and enrollment capped a couple of years ago. Even if a new student moved in next door to one of these schools, they would be forced to attend either Stephen Decatur or Lynwood. The ECC has a mold problem that the District has not remedied. They need to either spend money to fix that problem, or find new digs for the Kindergarten. Stinson's Plan to close Lynwood as an elementary school does several things that he does not mention in his Plan. There is not enough room in the remaining elementary schools, including a converted Intermediate School, to absorb all 26 Teachers currently assigned to Lynwood. Even if he intended to keep them all on the payroll (the Plan suggests in one place that the District might be able to avoid any teacher layoffs - and in other places suggests teacher layoffs regardless) there are not the requisite number of classrooms. Therefore - and this is most important - CLASS SIZE WILL RISE. There were 430 students enrolled at Lynwood last year (the latest information available on the State DOE's website). Given the enrollments at the other schools, one can calculate an increase of up to 26% in class size. This is the very last thing that should be done. Even though Stinson is trying to package it as an advancement in the educational practices at Decatur Schools, it clearly is not. It is the very worst thing that can happen in educational practices. The ECC is a fairly new operation. The building was renovated from a goodly portion of the old Middle School about a decade ago. It is outfitted with diminutive hardware that matches the size of its students. The idea that the District has squandered money and spent like sailors in port on other things and neglected the mold problem at the ECC is unconscionable. I have to give credit to Mike Kugelman, a former School Board member, for this idea. He's right. Redistrict to realign the enrollment and keep Lynwood open as an elementary school. Swapping all of the 1-4 graded and 5-6 graded schools to 1-6 schools is always a good thing. It is even possible to free up more space by returning the 7-8 middle school to a true 6-7-8 middle school. But, redistricting is the key component. Poll the families whose children attend Lynwood to see how many want to take advantage of the school choice option. It may not be all that many. Then redistrict to leave as much room in every school as possible. Money would have to be spent to clean up the mold problem at the ECC - but it is better than abandoning yet another good building to rot away as they have done with the old high school that sits just in front of the ECC. FROM WHERE WILL THE MONEY COME ? Stinson's Plan says that the District could avoid all teacher layoffs if the Teacher's Union agreed to a 5% cut in pay and benefits AND 17 teachers retired. My counter proposal asked for the 5% cut AND 5 teacher retirements, which is more feasible. The Union may be more inclined to accept the cut if they knew they were saving Lynwood Elementary School and keeping class sizes down. Stinson's Plan says that closing the ECC will save $624,690 a year. Although his Plan comes up one million dollars short of the needed $9.8 million, he also must find someone to take over his long term lease of the Mitchell Building, saving $810,000 a year. Under my counter proposal, which saves the entire $9.8 million, I had suggested going along, reluctantly, with the Lynwood closing and get Ivy Tech to cover its own rent, saving $624,690 and $164,000 a year respectively. But with the redistricting idea of Mike Kugelman, I would amend my proposal to the following. Keep Lynwood and the ECC where they are. Redistrict to free up space in all schools - even after accounting for expected transfers from Lynwood. Put forth a full court press to a) get Ivy Tech to cover its own rent in the Mitchell Building, b) get the Challenger Center finances straightened away so it pulls in revenue rather than gobbles up $380,846 a year, and c) realign the finances of the Decatur Discovery Academy so that it is self-sufficient through the Charter School funds already provided, instead of draining $265,501 a year from the rest of the District. I did not include the last two items in my counter proposal because accomplishing them relies upon Stinson's business acumen, which has proven to be non-existent. But, it is better than closing Lynwood as an elementary school, raising class size, and permanently closing the ECC building to rot. We have talented people in our Township. A small group of actual experts can be pulled together to get the Mitchell Building money pit situation squared away, as long as Stinson sits it out. When the three tenants of the Mitchell building pay their own way, as all were intended to do, then the District will save $810,000 a year - more than covering the $624,690 savings proposed for the vacation of the ECC. This is an extremely bad financial situation that Decatur Township Schools face. By keeping Lynwood open as an elementary school, keeping class size down, and fixing the mold problem at the ECC, the STUDENTS will suffer the least in the process of fixing the financial mess Stinson, Baer, and the School Board made. That is what should matter. I'll leave the campaign finance donor analysis in the capable hands of Gary Welsh at Advance Indiana (see here and keep checking back) and Paul Ogden at Ogden on Politics (see here and keep checking back). But, one thing made me laugh out loud reading the morning paper. Francesca Jarosz ran an item in the Indianapolis Star on Mayor Ballard's campaign finance report. In it there is a quote from one Jennifer Hallowell, "a general consultant to the Ballard campaign". But Hallowell said the fact that Ballard has raised so much cash proves he's capable as mayor. "It really demonstrates the support that he has and the leadership that he's provided," she said. "He's producing results, and people recognize that." Of course, that can be read more than one way. Leadership and producing results in getting donations -- is pretty much what I read. How anyone can conclude a person is a capable mayor by looking at the size of his campaign coffers is a thread of logic I cannot follow. But, I do have an idea how Ms. Hallowell made the connection. Although I don't feel the well of expertise to analyse donors and which firms they represent, doesn't mean I don't peruse the campaign finance reports. Even with my surface review of Mayor Ballard's report, payments to Hallowell Consulting jumped out at me. In fact, that's why I even recognized Ms. Hallowell's name this morning. Hallowell Consulting was paid a total of $92,857.14 between March 2, 2009, and November 6, 2009. On December 1, 2009, the firm donated $10,000 of in-kind consulting services. What that really means is that Hallowell Consulting took a pay cut for its services and the cut was used to pad Ballard's finance report. You don't have to review many campaign finance reports to see there is often a shell game going on to make the 'donations' look larger than they really are. Candidate A donates $200 from his campaign war chest to the 'Committee to Elect Candidate B'. Candidate B, in turn, donates $200 from his war chest to the 'Friends of Candidate A' coffers. Helps both candidates look better. But, aside from Hallowell Consulting's generous in-kind donation of advise to the Ballard Campaign, they still got $92,857.14 of cold hard cash. That's the kind of leadership a campaign consultant can believe in - and preach about. I figured it would be interesting to just get the highlights of each sitting Councillor's campaign finance report for 2009. Below I will record the name of the Councillor as a link to their report posted on the Election Board's campaign finance website. I'll list the beginning balance, the total of receipts, the total of expenses and the ending balance for each. I contacted the Election Board Office a few days ago, and they said it would take a few days after the January 20, 2010, filing deadline to get all reports posted online. I'll keep checking back and fill in the few we still have outstanding. Documents of the City of Indianapolis' clawback of abated property taxes from Navistar, obtained by Cathy Burton on behalf of the Marion County Alliance of Neighborhood Associations, expose a scary loophole in the law and policies governing Abatements that simply must be closed. The $5 million clawback agreed to in the settlement, also raises questions of whether the City has an inherent right to keep the entire check, or if it should be distributed in the same manner as property taxes would have been collected, had they not been forgiven or abated. The City routinely enters into tax incentive agreements with businesses. These are called 'abatements'. Abatements run from 5 years to 10 years in length and forgive a fraction of the property taxes that would have been due on an expansion of the business or creation or retention of jobs in Marion County. Abatements are proposed by the Mayor's Economic Development team and passed or rejected by the Metropolitan Development Commission (MDC). Notice to potentially interested parties is limited to the two weeks between the two MDC decisions - the latter of which is preceded by public comment. If an abatement is proposed within a Tax Increment Finance District (TIF District), then Council review is also required. These abatements routinely (for Marion County, not necessarily other Counties) contain what is termed 'clawback clauses'. These clauses require the return of the abated taxes should the goals of investment or jobs not be met by the business. It turns out that there is no state law or local ordinance or even City policy addressing how funds returned as clawback settlements are collected and distributed. K. Navistar believes the Auditor is a necessary party to this Settlement Agreement. Without agreeing that the Auditor is a necessary party and without prejudice to its ability to have the settlement payment described below directed to Indianapolis Economic Development, Inc. ("IEDI"), the City is not opposed to the Auditor's inclusion as a party hereto. 1. Settlement Payment and Satisfaction. Navistar shall pay a total settlement amount of five million dollars ($5,000,000). The settlement amount shall be paid by Navistar within fourteen (14) days of the complete execution of this Settlement Agreement, by check made payable directly to IEDI (defined above). The City agrees to accept payment of this settlement amount to IEDI in full, complete, and final satisfaction of any and all repayment of abatement savings and any other damages or liabilities relating to the Resolutions, the MOAs, and the Abatements arising with respect to the Tax Years. WOW !!! What if the agreement had gone through as originally drafted? Who would have know that a $5 million check had been passed from Navistar to IEDI - avoiding that messy part where the City actually collects the back taxes and the City-County Council appropriates it? That was close. Now, to its credit, the City decided not to go through with its original intention. The last minute is as good as any minute to change course from this huge mistake. Troubling enough as is. But word is that previous claw back payments may indeed have gone directly from the abated businesses to non-City recipients. I have not seen documentation of that, but that is the word I am getting. All claw back funds from the Peterson and Goldsmith administrations added together are said to amount to $700,000 and were not necessarily deposited into the City's coffers. There is a glaring lack of State Law regarding abatement clawback funds. There is a glaring lack of City Ordinance regarding abatement clawback funds. There is a glaring lack of City policy regarding abatement clawback funds. If funds do not have to be received by the City and can go directly to outside organizations due to lack of law, ordinance or policy, what is there to prevent the clawback funds from being deposited directly into a personal bank account? So, the scary part is that abatement clawback funds do not have to be directed to publicly accountable governmental units. Also needing definition, is who should be getting these monies in the first place. Clearly, the abated property taxes would have gone to the school district, library, health & hospital corp, and the City and County, among other governmental units, through a formula set for that taxing unit in which the business is established. It seems to me that the clawback funds should be distributed by that same formula. Instead of the City getting and spending the entire amount, they would receive roughly 20% of the funds. Big difference. In the case of the Navistar clawback funds, the Metropolitan School District of Warren Township would stand to get over $2.5 million, if the funds were distributed according to the property tax distribution formula. Because the Navistar Settlement Agreement was amended at the last minute, the City-County Council will have to appropriate the funds. Mayor Ballard wants $1.5 million to go to the Indianapolis Convention and Visitors Bureau (ICVA) and $3.5 million to go to IEDI. It seems to me that there are more pressing needs in Indianapolis and whatever funds are expended by the City should be sent their way. The Parks budget has been slashed mercilessly by Mayor Ballard. He won't stand up to the Chamber for fully funding the Department of Code Enforcement with fees - maybe some dough spent there would work for everyone. There is a study group investigating how to get more money for City street and sidewalk repair. This money would be a good faith effort to spend public funds already in hand before pulling more money out of our civic assets or purses. It is expected that the Council Proposal for appropriating the funds will be introduced at its February 1 meeting. I'll be letting you know to which committee it will be assigned once the Council agenda is published. Meanwhile, Indianapolis, Marion County, and likely other municipalities in Indiana, need serious loophole darning done to regulate receipt of abatement clawback funds through a transparent, public process. The saga of dismal fiscal management by the Metropolitan School District of Decatur Township is typified by their lease of space in the Mitchell Building in Ameriplex Industrial Park. From breaking three laws regarding the lease and renovation of the space, to the continued use of district funds for three educational enterprises who use the space, all of which should be self-sufficient, we see what happens when there is virtually no oversight of the Administration of a school district. The Indiana State Board of Accounts audit of the Decatur School District books released on May 29, 2008 (covering finances from July 1, 2005, to June 30, 2007), is a clear look at how Superintendent Don Stinson and Assistant Superintendent Jeff Baer, abetted by rubber-stamping School Board members, Don Huffman, Cathy Wiseman, Judy Collins, Larry Taylor, and Taylor's replacement, Dale Henson, ran the School District finances. I have already talked about the purchase of 4 properties during that time, without the required number of appraisals of the fair market value, clearly overpaying by 41% on one property - in violation of two aspects of state law. I have already talked about the reimbursement of credit card expenses without the proper receipts. And, I have already talked about how Stinson and Baer broke state law by spending millions of dollars more from funds than were appropriated by the School Board. The audit released in 2008, which I again recommend all Decaturites review for themselves, speaks also to how Stinson and Baer broke state law by entering into the Mitchell Building lease contracts, broke state law by entering into a renovation agreement for the space, and broke state law by entering into a lease agreement over 10 years in term without the approval of the State Department of Local Government Finance (DLGF). In a single lease, they avoided the required review from the upper levels of government (the DLGF), and avoided the required review from the lower levels (the School Board), all in place to represent the best interests of the public and to protect the public from an overreaching or ill-informed District Administration. The School Corporation entered into a lease agreement with Mitchell Logistics Partners L.P. for the Decatur Discovery Academy. The original lease was signed by the Superintendent and was for a period of 127 months (10 years and 7 months). The School Corporation, in order to expand the Decatur Discovery Academy, paid $584,460 in 2006 for the renovation of additional office space owned by Mitchell Logistics Partners L.P. The Renovation Agreement was signed by the Assistant Superintendent of Business. The subsequent lease amendment for the expanded Decatur Discovery Academy increased the term by another 12 months and also was signed by the Assistant Superintendent of Business. No documentation was provided regarding approval by the Department of Local Government Finance for the lease to exceed a term of 10 years. "Notwithstanding any other law, the president and secretary of the governing body of a school corporation are entitled, on behalf of the school corporation, to sign any contract, including employment contracts and contracts for goods and services. However, each contract must be approved by a majority of all members of the governing body. In the absence of either the president or secretary of the governing body, the vice president is entitled to sign the contracts with the officer who is present." (1) The term of the lease may not be longer than ten (10) years; however, a lease may be for a longer term if approved by the department of local government finance." "(a) A lessor proposing to build, acquire, improve, remodel, or expand a structure for lease to a political subdivision or agency shall submit plans, specifications, and estimates to the leasing agent before executing a lease." In entering into the initial 10 year 7 month lease for space in the Mitchell Building, Stinson and Baer violated two state laws -- one requiring prior approval of the DLGF and the other requiring the signature of School Board member(s) on the contract. In entering into the $584,460 renovation agreement, Stinson and Baer violated two state laws -- one requiring the signature of School Board member(s) on all contracts and the other requiring detailed plans and cost estimates prior to signing the agreement. In entering into the extension of the lease agreement for another 12 months, Stinson and Baer violated two state laws -- one requiring prior approval of the DLGF and the other requiring the signature of School Board member(s) on the contract. The tenants of the Decatur School District's leased space are three enterprises that should be self-sufficient. All three are educational enterprises of which I highly approve; it is just using the District as a funding source that I strenuously object to. First is Ivy Tech. Ivy Tech is in the business of education for a profit. Ivy Tech should be paying the rent on the space it uses in the Mitchell Building. Instead we find from Stinson's "Fiscal Restructuring Plan", that the District chips in at least $164,000 a year for Ivy Tech's space. Second is the Challenger Center. Again, the Challenger Center was to become self-sufficient through charges for groups to use the facility. Instead, from the "Plan" we find that the District is covering at least $380,846 a year for the space and two teacher salaries. And, third is the Decatur Discovery Academy, which is an alternative school that was created as a Charter School. Yet again, this enterprise should have been self-sufficient using Charter School funds. Instead we see that the District pays at least $265,501 a year for its space. All together, the Mitchell Building lease exemplifies the fiscal mismanagement we see in the rest of the Decatur School District. State laws were broken to establish and extend the lease, state laws were broken to make renovations to the space, and the District is throwing over $810,000 a year at three worthwhile enterprises that should be self-sufficient. The long term lease agreement for the Mitchell Building space will run until at least 2016, draining much needed funds from the primary task of the School District - the education of Decatur's children. I previously suggested that the Metropolitan School District of Decatur Township sell off its excess property portfolio and make a variety of Administrative cuts in order to dig itself out of the disastrous financial hole dug by Superintendent Don Stinson and Assistant Superintendent for Business Jeff Baer, abetted by a rubber-stamping School Board. I guess my brain could not process how truly deep a disastrous financial hole had been dug. So, with this entry I amend my suggestion for cuts to begin what will be a long, painful, process of making ends meet in the School District. HOW DEEP IS THE HOLE AND HOW DID WE GET IN SO DEEP? The total amount of cuts necessary totals $9.8 million. The cuts required of all school districts by Governor Mitch Daniels, to the tune of 3.5%, amounts to $1.4 million for our District, according to Stinson's Fiscal Restructuring Plan. This cut is necessary because of the recession. I'm not a fan of the Governor, but I must give him credit that he did make cuts in all other spending before dipping into K-12 education revenues. Cuts of $5.4 million are needed because of the mind boggling amount of debt Stinson, Baer, and the School Board have put on us. As part of the tax cap legislation, the State took over all funding for operations and transportation costs in all Indiana School Districts. That funding shifted last year and is the biggest reason many tax bills went down. As far as Schools are concerned, property taxes pretty much only go to cover payments on debt any more. But, because of the spending and buying sprees the Decatur officials went on over the last 8 years, the amount of property taxes they will get in 2010 will not be enough to cover the debt payments. So, Decatur Schools will have to add some of the operating and transportation money to the property tax revenues, so that they do not go into default on the bonds they have floated over the years. It is up to the District how much of the extra funds come from the Transportation Fund and how much from the General Fund. But, because the debt is so huge, a total of $5.4 million has to come from these two Funds in some combination. Stinson and Baer claim they also must make cuts of $3 million to repay temporary loans. Because of Governor Daniels order for a new 2006 reassessment in Marion, and the resulting delay in collecting property taxes, all of the governmental units in our County have had to take out temporary, low interest, tax anticipation loans. Before each calendar year started, the Indiana Department of Local Government Finance (DLGF) would tell each governmental unit how much money they could expect down the road, 6 months to a year later, from taxes that eventually would be collected, just delayed. Then each unit would get a tax anticipation loan. Once the property taxes were collected, the units would use the money to pay off the loans. Interest rates were below 3%, throughout this period, at least for the tax anticipation loans the City of Indianapolis obtained. Well, we are almost back on track and the pay-2010 property taxes will go back to the May/November due dates. So, the last of the tax anticipation loans will get paid off shortly after the pay-2009 tax bills are collected in February. The question here is - how could the Decatur School District manage to owe $3 million for interest on a low interest, tax anticipation loan for all of 8 months? Even if the loan was for a year and the interest rate was 3%, you would have had to borrow $100 million to owe $3 million in interest. That is far more that the District's total budget for a year, much less only the property tax revenue for which they would have taken a tax anticipation loan. Through 2008, the latest year for which data are available on the State Department of Education website, the Decatur School District paid only $367,033 for interest on short term loans. Now they claim over $3 million is due? That doesn't pass the smell test. HOW DO WE DIG OUT ? The hole Stinson, Baer and the Decatur School Board dug is $9.8 million. On the just slightly good side, $3 million should be a one-time shortfall and we can look for one time savings and not on-going cuts for that amount. The 3.5% cut ordered of all Districts by Mitch Daniels, and amounting to $1.4 million for Decatur Schools, will likely be somewhat longer and dependant upon the State's recovery from the recession. So, for that we should look to on-going cuts that could be restored in a few years. But, for the $5.4 million in cuts to cover debt payments, the cuts will essentially have to be considered permanent as the debt will still hang over our heads for decades to come. Previously I listed where $5.7 million in cuts could be obtained. Here I will amend that list by adding to it and covering the additional $4.1 million - thereby getting us to $9.8 million in cuts. I have chosen specific items from Don Stinson's Fiscal Restructuring Plan to supplement my original suggestions. The District should sell its land holdings and its equity in the lease to buy agreement for the Southwest Office Pavilion (the old Concentra Building). This could generate $4.9 million. This could cover the one-time expense of $3 million plus the $1.4 million cut ordered by Daniels, with $0.5 million left over. Cut Don Stinson's salary plus benefits package by 20% - save $67,000 every year. Cut Candice Baer's job along with one other Central Office Administrator - save $330,000 every year. Replace Susan Adams' administrator position with a custodian - save $100,000 every year. Replace Gary Pellico's administrator position with a public relations person - save $100,000 every year. Cut 4 building level Administrator positions - save $540,000 every year. Cut all Administrator salaries plus benefits by 15%. This is larger than I originally proposed but they all got healthy raises when times were good, now they have to carry some burden while times are bad. You figure the average administrator is making $150,000 between salary and benefits - so a 15% cut would still leave them with $127,500 per year. Save about $575,000 every year. These Administrator cuts would save the District $1.71 million per year. Cut Teacher salaries plus benefits by 5% - save $1.3 million every year. These Teacher cuts would save the District $1.8 million every year. These cuts in support staff would save the District about 176,000 every year. These changes in building use would save the District about $829,000 every year. These cuts would save the District about $376,000 every year. All totaled, these cuts add up to $9.79 million. Other questionable expenses exist in the long term lease of the Mitchell Building. Unless some other entity agrees to take over that lease, the School District is on the hook for years to come. But it should be questioned why the Challenger Center is not self-sufficient. The taxpayers appear to be paying out over $380,000 every year for the Center. Other Centers around the Country make money, not run deficits. Also to be questioned is the expenditure of $265,501 per year for the Decatur Discovery Academy. This is a Charter School and should be able to survive using Charter School funds. If the School District can correct these issues, it could save another $645,000 every year. These suggested cuts meet the goal, but preserve the Teaching Staff, Custodial Staff, Transportation Staff, Maintenance Staff, and the remaining security Staff. Any additional savings should first be applied to bringing back the trained security staff to man the High School and provide the first critical response in case of an emergency. The suggestion of closing Lynwood as an Elementary School is painful, but the failure to improve the education of the students enrolled there, combined with the overcrowding at Valley Mills and West Newton Elementary Schools, seems to leave no other alternative. Is There Enough Oxygen on the 25th Floor?